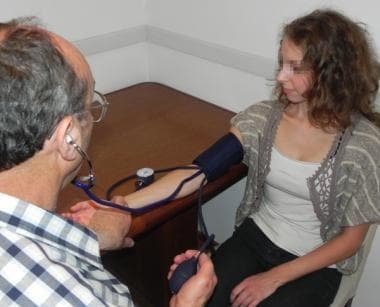 Blood pressure assessment is an integral part of clinical practice. Routinely, a patient’s blood pressure is obtained at every physical examination, including outpatient visits, at least daily when patients are hospitalized, and before most medical procedures. Blood pressure measurements are obtained for a wide variety of reasons, including screening for hypertension, assessing a person’s suitability for a sport (see the Medscape Reference topic Sports Physicals) or certain occupations, estimating cardiovascular risk (see the Medscape Reference topic Risk Factors for Coronary Artery Disease), and determining risk for various medical procedures. Blood pressure measurements are also obtained routinely when following a hypertensive patient to assist with tailoring of medications and treatment of hypertension. Finally, blood pressure measurements are crucial for identifying if a patient is in potential or actual clinical deterioration. Therefore, the indirect (noninvasive) method is typically used. The indirect method involves collapsing the artery with an external cuff, providing an inexpensive and easily reproducible way to measure blood pressure. The indirect method can be performed using a manual cuff and sphygmomanometer, a manual cuff and doppler ultrasound, or with an automated oscillometric device. The manual method requires auscultation of the blood pressure, whereas the automated system depends on oscillometric devices. Another key component of measuring a manual blood pressure is an understanding of the Korotkoff phases. The Korotkoff phases have been classified as 5 phases with phases I, IV, and V integral to obtaining an accurate blood pressure measurement. Descriptions of the 5 Korotkoff phases are outlined in the table below. a Use as the diastolic pressure if the pressure at the initiation of phase V is 10 mmHg or greater than the pressure at phase IV. b Accepted as the standard level of diastolic blood pressure. The Korotkoff sounds are believed to originate from a combination of turbulent blood flow and oscillations of the arterial wall. Of note, some believe that using the Korotkoff sounds instead of direct intra-arterial pressure typically gives lower systolic pressures, with one study finding a 25 mmHg difference between the 2 methods in some individuals. [6, 7] Furthermore, some disagreement exists as to whether Korotkoff phase IV or V correlates more accurately with the diastolic blood pressure. Typically, phase V is accepted as the diastolic pressure due to both the ease of identifying phase V and the lower discrepancy between intra-arterial pressure measurements and pressures obtained using phase V.  Phase IV, alternatively, is used to measure the diastolic pressure if a 10 mmHg or greater difference exists between the initiation of phase IV and phase V. This may occur in cases of high cardiac output or peripheral vasodilatation, children under 13 years old, or pregnant women. Regardless of whether a manual or automated method is used, the blood pressure measurement is a key part of clinical medicine. The following is a description of the indications, contraindications, and techniques for obtaining a blood pressure using both manual and automated devices. If possible, one should also avoid checking blood pressure in the extremity with intravenous access. In these instances, using the other arm is recommended; if bilateral arteriovenous fistulas or lymphedema exist, then obtaining a lower extremity blood pressure is recommended. One should delay obtaining a blood pressure is if the patient has smoked, exercised, or had caffeinated products or other stimulants prior to the measurement. Smoking 30 minutes before the procedure can transiently elevate the blood pressure. Exercising before measuring the blood pressure can lower the reading. Caffeine or other exogenous adrenergic stimulants taken before the measurement can acutely raise the blood pressure reading. To obtain a blood pressure, one can use either a manual blood pressure cuff or an automated oscillometric cuff. 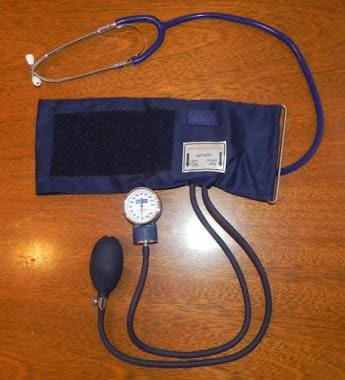 When obtaining a manual blood pressure, a stethoscope and blood pressure cuff with a sphygmomanometer is required (see image below). Standard aneroid blood pressure cuff and stethoscope. 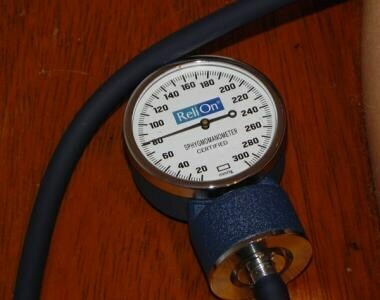 Any standard stethoscope can be used to auscultate the Korotkoff sounds while measuring the blood pressure. Although the bell of the stethoscope allows for more accurate auscultation, the diaphragm is more routinely used because of ease of use. When using an automated oscillometric cuff, a stethoscope is not needed. Automated oscillometric blood pressure measuring devices are now more commonly used due to their ease of use and availability. The oscillometric devices obtain the systolic measurement by detecting oscillations on the lateral walls of the occluded artery as the cuff is deflated. The oscillations begin at the level of systolic pressure. Of note, the measurements obtained from automated measuring devices are typically lower than those obtained with manual devices. Measurements with an inappropriately small cuff may result in an overestimation of the true systolic pressure. Conversely, those made with a large cuff can underestimate it. If measuring blood pressure using a cuff and Doppler ultrasound, then you will need either an ultrasound machine with doppler capabilities, or a hand-held vascular doppler. Participant positioning is vital to obtaining an accurate blood pressure. Before obtaining a blood pressure, the participant should remain in a seated position for at least 5 minutes. During this time they should be comfortable and relaxed in a chair with back support, legs should be uncrossed, and feet should rest comfortably on the floor (see image below). Patient position for manual blood pressure. Once the examiner is ready to measure the blood pressure, the participant’s arm should be supported comfortably at the level of the heart. Falsely elevated or lowered blood pressures may be obtained if the arm is below or above the level of the heart, respectively. The examiner should ensure that the sphygmomanometer is visible to him/her and that they are also comfortably positioned (see image below). The blood pressure cuff should then be placed with the bladder midline over the brachial artery pulsation. Ideally, no restrictive clothing should be on the participant’s arms. Rolling up the sleeve can cause a tourniquet around the upper arm, thus falsifying the measurement. If possible, the lower end of the cuff should be 2-3 cm above the antecubital fossa to minimize artifactual noise related to the stethoscope touching the cuff. Initially, before taking the blood pressure, the patient should remain seated and at rest for 5 minutes. Consumption of caffeinated products such as coffee, cola, or tea should be avoided for at least 30 minutes prior to measuring the blood pressure. Additionally, activities such as smoking and exercising 30 minutes prior to measuring the blood pressure should also be avoided. While obtaining the blood pressure, neither the patient nor the person obtaining the blood pressure should talk. Inflate the cuff to a pressure of 30 mmHg above the level at which the radial pulse is no longer palpable (see image below). Aneroid sphygmomanometer at level 30 mmHg above the level at which the radial pulse is no longer palpable. While slowly deflating the cuff (approximately 2-3 mmHg per heartbeat), listen for Korotkoff phase I while watching the blood pressure gauge. Korotkoff phase I can be identified by when the first pulse is auscultated. This sound is clear, repetitive, and tapping in nature and often coincides with the reappearance of a palpable pulse. Record the measurement from the sphygmomanometer at which the sounds first appear; this represents the patient’s systolic blood pressure (see the image below). Aneroid sphygmomanometer at level of systolic blood pressure. 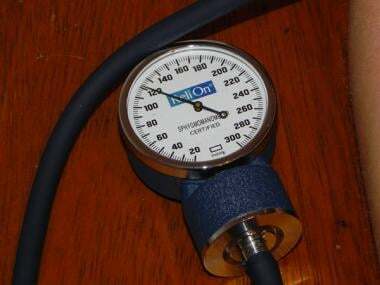 While watching the sphygmomanometer, continue to slowly deflate the cuff. Initially, an abrupt soft, indistinct, muffling sound may be heard (Korotkoff phase IV). After this sound, continue listening until the sounds disappear completely (Korotkoff phase V). Record the measurement from the sphygmomanometer when Korotkoff phase V starts; this represents the patient’s diastolic blood pressure. If there is a 10 mmHg or greater difference between Korotkoff phase IV and phase V then the pressure reading at phase IV should be recorded as the diastolic blood pressure. This may occur in cases of high cardiac output or peripheral vasodilatation, children under 13 years old, or pregnant women. After the last Korotkoff sound is heard, continue deflating the cuff for another 10 mmHg to ensure that no further sounds are heard. Then deflate the cuff and allow the patient to rest (see image below). 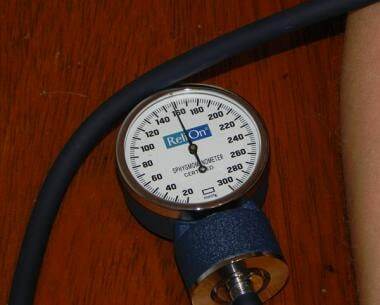 Aneroid sphygmomanometer at level of diastolic blood pressure. Wait at least 30 seconds and repeat the previous 3 steps to obtain a second blood pressure measurement. If the measurements have greater than a 5 mmHg difference, then readings should continue until 2 consecutive stable measurements are obtained. An average of the 2 stable measurements should be recorded as the patient’s blood pressure. Wait another 1-2 minutes and repeat steps 4-10 to measure the blood pressure in the patient’s opposite arm. If a measurement discrepancy exists between the 2 arms, then the arm with the highest measurement should be used. When recording the blood pressure measurement, note not only the pressure but also which arm was used, the arm position, and the cuff size used. Alternatively, the blood pressure may be obtained using the thigh or the wrist. A thigh blood pressure is typically obtained when an arm to leg gradient is suspected such as with aortic coarctation or if there is a contraindication to upper extremity measurements. The wrist blood pressure is typically obtained in obese patients, where it may be difficult to find an appropriately sized cuff for the arm or thigh. The same measurement techniques are used for the leg and wrist as discussed above for the arm. Of note, values obtained from thigh or wrist measurements may be higher than arm pressures due to increased hydrostatic pressure related to the lower position of the thigh and wrist to the heart. The accuracy of the wrist measurement can be improved by keeping the wrist at the level of the heart. Consumption of caffeinated products such as coffee, cola, or tea should be avoided for at least 30 minutes prior to measuring the blood pressure. Additionally, activities such as smoking and exercising 30 minutes prior to measuring the blood pressure should be avoided. Place the automated oscillometric cuff on either the right or left arm of the patient. Ensure that the cuff is the appropriate size (see the Equipment section). Initiate the automated device, causing it to inflate and then deflate. The device typically shows the blood pressure recording on an external display. Wait 2 minutes and obtain a second blood pressure measurement. If the measurements have greater than a 5 mmHg difference, then readings should continue to be obtained until there are 2 consecutive stable measurements. An average of the 2 stable measurements should be recorded as the patient’s blood pressure. Wait another 1-2 minutes and repeat steps 3-7 to measure the blood pressure in the patient’s opposite arm. If a measurement discrepancy exists between the 2 arms, then the arm with the highest measurement should be used. When obtaining pressure reading using a sphygmomanometer and doppler, begin the same way but instead of using a stethoscope, use conduction gel and a doppler probe. Place the probe on the brachial or radial artery of the arm with the cuff and inflate until you obliterate the pulse on the doppler. Go 20–30mmHg above the pressure at which the pulse was obliterated. Slowly deflate, listening for the same Korotkoff sounds. This technique is especially useful in vasculopathic patients and those in circulatory distress. Complications are minimal with measuring the blood pressure. Complications that can occur include discomfort to the arm and possible petechiae in patients taking anti-platelet agents. The patient should be given the results of their blood pressure measurement. If the pressure is above normal (typically defined as a measurement ≥120/80) the patient should be advised to follow up with their health care provider. If the patient is demonstrating any signs of Hypertensive Emergencies they should be referred immediately to a physician or emergency room. Stethoscope or doppler and a blood pressure cuff with a mercury or aneroid sphygmomanometer, or automated oscillometric blood pressure measuring device. Choose an adequate cuff size based on the patient’s arm size. Place the chosen cuff on either the patient’s arm. Place the stethoscope over the brachial artery. Inflate the cuff to a pressure of 30 mmHg above the level at which the radial pulse is no longer palpable. While slowly deflating the cuff, listen for Korotkoff phase I while watching the blood pressure gauge. Record the measurement from the sphygmomanometer when Korotkoff phase I is auscultated. This represents the patient’s systolic blood pressure. While watching the sphygmomanometer, continue to slowly deflate the cuff, listening until a pulse is no longer auscultated (Korotkoff phase V). Record the measurement from the sphygmomanometer at the onset of Korotkoff phase V. This represents the patient’s diastolic blood pressure. Record the blood pressure, arm used, the arm position, and the cuff size used. Perloff D, Grim C, Flack J, Frohlich ED, Hill M, McDonald M. Human blood pressure determination by sphygmomanometry. Circulation. 1993 Nov. 88(5 Pt 1):2460-70. [Medline]. Smulyan H, Safar ME. Blood Pressure Measurement: Retrospective and Prospective Views. Am J Hypertens. 2011 Feb 24. [Medline]. Skirton H, Chamberlain W, Lawson C, Ryan H, Young E. A systematic review of variability and reliability of manual and automated blood pressure readings. J Clin Nurs. 2011 Mar. 20(5-6):602-14. [Medline]. Landgraf J, Wishner SH, Kloner RA. Comparison of automated oscillometric versus auscultatory blood pressure measurement. Am J Cardiol. 2010 Aug 1. 106(3):386-8. [Medline]. Myers MG, Godwin M, Dawes M, Kiss A, Tobe SW, Grant FC. Conventional versus automated measurement of blood pressure in primary care patients with systolic hypertension: randomised parallel design controlled trial. BMJ. 2011. 342:d286. [Medline]. ROBERTS LN, SMILEY JR, MANNING GW. A comparison of direct and indirect blood-pressure determinations. Circulation. 1953 Aug. 8(2):232-42. [Medline]. Breit SN, O'Rourke MF. Comparison of direct and indirect arterial pressure measurements in hospitalized patients. Aust N Z J Med. 1974 Oct. 4(5):485-91. [Medline]. Pickering TG, Hall JE, Appel LJ, Falkner BE, Graves J, Hill MN. Recommendations for blood pressure measurement in humans and experimental animals: part 1: blood pressure measurement in humans: a statement for professionals from the Subcommittee of Professional and Public Education of the American Heart Association Council on High Blood Pressure Research. Circulation. 2005 Feb 8. 111(5):697-716. [Medline]. Daskalopoulou SS, Rabi DM, Zarnke KB, Dasgupta K, Nerenberg K, et al. The 2015 Canadian Hypertension Education Program recommendations for blood pressure measurement, diagnosis, assessment of risk, prevention, and treatment of hypertension. Can J Cardiol. 2015 May. 31 (5):549-68. [Medline]. Piper MA, Evans CV, Burda BU, Margolis KL, O’Connor E, Smith N, et al. 2014 Dec. [Medline]. [Full Text]. Bryant JR, Hajjar RT, Lumley C, Chaiyasate K. Clinical Inquiry-In women who have undergone breast cancer surgery, including lymph node removal, do blood pressure measurements taken in the ipsilateral arm increase the risk of lymphedema?. J Okla State Med Assoc. 2016 Nov. 109 (11):529-531. [Medline]. [Full Text]. Valler-Jones T, Wedgbury K. Measuring blood pressure using the mercury sphygmomanometer. Br J Nurs. 2005 Feb 10-23. 14(3):145-50. [Medline]. O'Brien E. Ambulatory blood pressure measurement is indispensable to good clinical practice. J Hypertens Suppl. 2003 May. 21(2):S11-8. [Medline].